Every decent person wants to help the environment, but when you're a small business owner your first concern is always with staying afloat. Investing in green technologies can sound risky. However there are an increasing number of ways in which you can protect the planet that don't cost the Earth, and in doing so, you can set an example to your local community that makes it easier for everyone to do the right thing. Boosting your reputation as a caring business can bring in a lot more customers. It can be good business to go green. If you've decided that you want to run a greener business, there are several simple and inexpensive things you can do to get started. Recycling - Business waste makes up a shockingly high proportion of Britain's landfill and much of it could be recycled. Setting up recycling schemes which customers can participate in too is a great way to get them involved with your business and raise your profile in the local community. Energy Saving - Set an example by turning off unnecessary lighting, turning down the heat and investing in energy saving technologies. You can mention this in your advertising to show that you're genuinely committed to change, creating a dynamic, forward-looking image. Stocking Green Products - Make things easy for your customers by stocking products which you know are environmentally friendly. This can also apply to service industry businesses - for instance, delivery services can use recycled cardboard packaging and hairdressers can use products free from polluting chemicals. Providing Advice - Why not be a reference point for your customers? As your green reputation grows, you can put up advisory posters on your business premises and offer leaflets to customers. Keep informed and be ready to answer their queries about the green issues relating to different processes, products and services. If you want to take bigger steps to protect the environment, such as installing solar panels or improving your insulation, there may be government grants and loans, and even tax breaks, available to help you. Many of these schemes are run locally, so ask our business support centre for details. As a green business you may also be eligible for membership in local council promotional schemes, providing you with free advertising. Developing a business model that your community can be proud of means the government will be willing to invest in you. As well as government support, you'll find that there can be extra help available from institutions. Some banks offer promotional opportunities to customers who show a commitment to the environment. 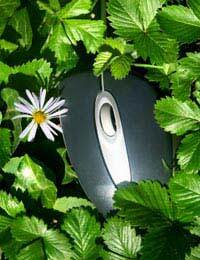 Going green is good for business networking and will raise your profile in the business world. Far from representing a risky investment, going green could be the best move your business ever makes. It offers amazing opportunities to engage with your customer and make yourself popular in the local community. Writing about your environmentally friendly business initiatives in the green press can bring in lots of new customers, and you'll find that you experience a big increase in customer loyalty. When customers know that you're investing in their future - in everybody's future - they'll be happy to reward you. So don't miss out on the chance to move forwards. Don't wait until it's too late and you start to look like a dinosaur, able only to struggle to catch up. Get ahead - go green now and let your business reap the rewards.